PARIS --- The defense agreements announced yesterday by France and Brazil go well beyond the long-anticipated sale of 36 Rafale combat aircraft, and extend the bilateral strategic partnership to the field of aviation and of army equipment. Brazil’s decision to open negotiations for the Rafale was mirrored by France’s surprise announcement that it would buy 10 Brazilian-made KC-390 transport aircraft for about 500 million euros. This is a new aircraft being developed by the Brazilian air force and Embraer, and which is due to enter service in 2015. French President Nicolas Sarkozy also offered to help with its development. “We want to develop a major aerospace industry, to make aircraft together, and to sell aircraft together,” Sarkozy told reporters. “This agreement is for the Rafale…now, we can talk about the next Rafale,” he added, implying that the two countries might jointly develop a successor. “We want to think jointly, to create jointly, to build jointly and, if possible, to sell jointly,” echoed Brazilian President Luiz Ignacio Lula da Silva. France’s willingness to transfer technology, and allow local production, were the decisive factors. "Taking into account the extent of the technology transfer proposals and the guarantees offered by the French side, President Luiz Inácio Lula da Silva announced the decision of the Brazilian side to enter into negotiations with the GIE Rafale for the purchase of 36 fighter planes," said the joint communiqué issued after Lula’s meeting with French President Nicolas Sarkozy. 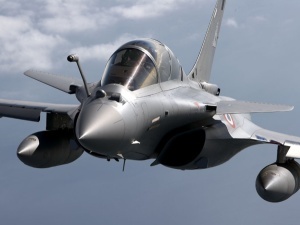 The Rafale deal is valued by French government sources at 4.5 to 5 billion euros, excluding the aircraft’s weapons which will add another billion euros or so. When added to contracts for the licence-production of 50 Eurocopter EC-725 helicopters (1.85 billion euros), of four Scorpene diesel-electric submarines, of a nuclear-powered attack submarine (4.9 billion euros) and of related infrastructure projects, the Rafale deal boosts the value of French weapons ordered by Brazil to over 12 billion euros (approx. $17.1 billion). The Brazilian sale is crucial for Dassault Aviation, which has been trying to export the Rafale for several years, but which has lost several competitions. Things have been looking up of late, however, as France is also negotiating the sale of 60 Rafales to the United Arab Emirates and of 14-18 more to Libya. The Rafale is also competing for an Indian order covering 126 aircraft, and for a Swiss order for 24 more. The contract with Brazil should be concluded by 2010. “Technical negotiations will now take place on the exact perimeter of the offer, on the aircraft, its support and maintenance package and its weapon package,” according to a Dassault spokesman. This will be followed by financial and commercial negotiations, and finally by the negotiation of the contractual clauses, he said. If the contract is signed in 2010, initial deliveries will follow in 2013. France will deliver the first six aircraft from its own assembly line, but the remaining 30 will be locally-assembled by Embraer over a period of six years. The contract will also include options for as many as 84 additional aircraft. Beyond the Rafale, the two presidents extended the bilateral defense partnership into the field of army equipment. In a joint statement of intent, the two countries’ defense ministers said France would cooperate in Brazilian army modernization programs, including digitalization, the networking of operational units, border monitoring and surveillance, and telecommunications. An initial deal was announced by two private companies, Brazil’s Agrale and France’s Renault Trucks Defense, who said they would cooperate for the production and sale of military transport vehicles. These wide-ranging framework agreements follow two separate deals, first announced in December 2008, and for which the final contracts were signed yesterday. One contract, worth 1.85 billion euros, covers the licence-production the Eurocopter EC-725s while the other, valued at 6.8 billion euros, covers the submarine package and related shipyards and naval base. These contracts are being largely financed by loans totaling 6.1 billion euros extended by a pool of French banks. Brazil’s announcement that it had selected the Rafale was in doubt until the last minute, as the air force has still not concluded its final report to the government on its evaluation of the three aircraft it had short-listed for the contract: Saab’s Gripen NG and Boeing’s F-18E Super Hornet, in addition to Rafale. Brazilian officials declined to discuss the legal implications of breaking off the tender at such a late stage, according to local media. “The decision was taken to negotiate with one supplier, and not to open negotiations with the others,” Brazilian Foreign Minister Celso Amorim told reporters in Brasilia Sept. 7. He declined to elaborate. As currently envisioned, the final contract for the sale of the Rafale should be concluded in 2010, leading to initial deliveries in 2013. France will deliver the first six aircraft from its own factory, but the remaining 30 will be locally-assembled by Embraer over a period of six years. The contract will also include options for as many as 84 additional aircraft, which would bring Brazil’s total Rafale buy to 120. The presidents of Brazil, Luiz Inácio Lula da Silva, and France, Nicolas Sarkozy, announced on Monday, September 7, 2009, a new step in cooperation between the two countries in the aeronautics field. France has announced its intention to contribute to the development of airplane design KC-390, a jet-powered transport aircraft that Embraer is developing with the requirements of the Brazilian Air Force to replace its US-manufactured Hercules turboprop transports. France may also purchase ten units of the new aircraft. Brazil has opened negotiations with the French for the purchase of 36 Rafale fighter jets as part of its project FX-2. According to President Lula, more details regarding these negotiations will be released by the end of the week. The Joint Communiqué, which disclosed how advanced are the negotiations on the Rafale and the KC-390, was a surprise element of the two leaders’ statements to the media. Until then, the expectation was that they would only formalize agreements on the construction program of a nuclear-powered submarine (with intermediate construction of four conventional boats) and the construction of 50 French EC-725 transport helicopters in Itajubá. "It is the consolidation of a strategic partnership of two peoples who have much in common," said President Lula. He said the partnership is not just commercial. "We want to think together, create together, build together and, if possible, sell together," he said. Defense Minister Nelson Jobim, who led the negotiations with the French until the early hours of Monday, said no details can be released at the present stage of the talks. “President Luiz Inácio Lula da Silva and President Sarkozy decided that Brazil and France will also be strategic partners in the field of aviation, where both countries have important and complementary advantages. “In this context, the French President informed the Brazilian President of France's intention to acquire a dozen units of the future military transport aircraft, KC-390, and expressed the willingness of French manufacturers to contribute to the development of this aircraft program.